New York Times: Hurricane Sandy, now battering the Bahamas, is expected to head up the East Coast over the weekend and possibly collide with a winter blast, producing what weather forecasters fear could be a historic and potentially devastating storm for a large swath of the Northeast and mid-Atlantic early next week. Details here. 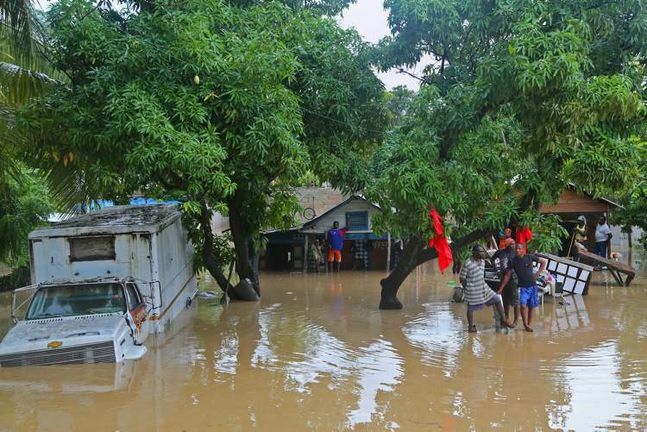 Residents find higher ground as the water level continues to rise in Leogane, Haiti, Friday. 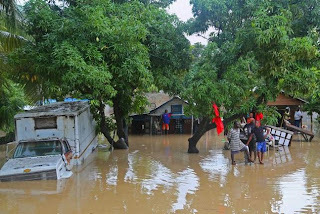 Leogane has endured five consecutive days of rain due to the aftermath of Hurricane Sandy. PLT: The deafening silence emanating from the US campaign trail about climate change can only be further evidence of the disconnect between politicians and power on the one hand, and reality and science on the other. How many "Frankenstorms" will we have to endure before they remove their heads from their a...., er I mean, the sand and start telling it like it is? Please also read: "IT'S GLOBAL WARMING, STUPID!"